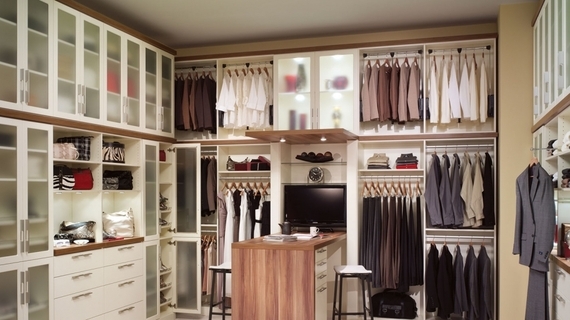 A clean and organized closet can give you peace of mind and save you time and money, according to experts. However, we tend to clutter those closets with clothes that don't fit, linens, tax records and anything else we want out of sight. Reporter at Angie's List, a national consumer reviews and local services site offering advice on everything from home repair to health care. "We wear about 80 percent of our clothes 20 percent of the time," says Tracy McCubbin, owner of dClutterfly in Los Angeles. When the clothes pile up, it reaches the point where you don't even want to open your closet door. According to Adele Mahan, owner of Fresh Start Transitions in Charlotte, North Carolina, that's when people give up on the closet and start dumping clothes on a chair, opening the rest of the home to clutter. Consider these helpful hints to get your closet in tip-top shape before it overflows into the rest of your house. Start with a clean slate by taking everything out of the closet. Once everything is out, it's easier to dust, vacuum or even paint the closet. Separate your clothing into categories, with piles for each type of item, such as pants, skirts, blouses, shirts, shoes and boots. Go through your clothes and be really honest. If you haven't worn something in a year, or if it's in poor condition or doesn't fit, get rid of it. There's no point in spending time organizing clothes you'll never wear. For items you're purging, ask yourself, "Could someone else use this?" If so, donate the item to a local charity or Goodwill. If it's too worn to give away, add it to the trash pile. McCubbin recommends the hanger experiment if you have trouble getting rid of clothes. Put all your hangers backwards. After you wear and wash something, put it back on a hanger facing the correct way. If there are any hangers left backwards after six months, then it's time to give those garments a new home. Consider storage methods for clothes that won't be making an appearance for months. Where you put them depends on your space situation, but storage options include garment bags in the attic or Rubbermaid tubs under the bed. Mahan says your closet is prime real estate. You shouldn't allow items you don't use on a weekly basis to take up space. Find a new spot in your home to store those holiday decorations. 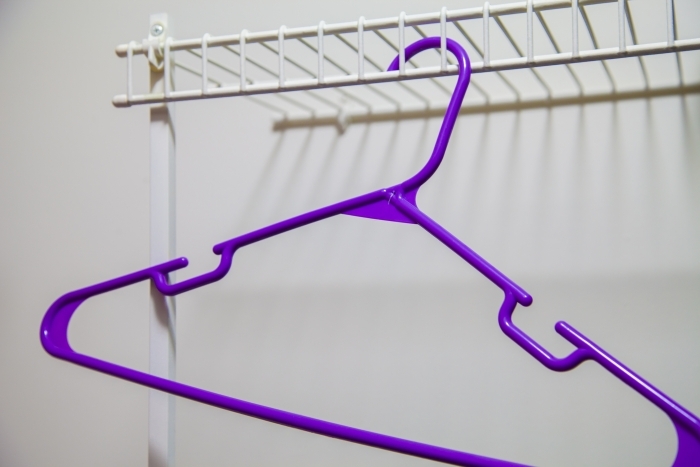 Wooden, plastic, colored and even dry cleaner hangers are the hodgepodge that makes up majority of closets. "Matching hangers makes all the difference in the world," McCubbin says. "Hangers are a tool and they really benefit you." Consider purchasing fewer articles of clothing that are well made. You'll have more room in your closet and won't have to worry about the five shirts missing buttons. Does your closet consist of a single shelf with one rod running under it -- and does that work for you? Consider adding another rod to double your hanging space. Mahan says she hangs her pants on the top rod so she can see the colors better. The shirts are easier to spot on the bottom since they have patterns and brighter colors, she says. Mahan recommends investing in a quality, bright light. "If the closet is dark, you're not going to go in there," she says. Adding shelves or cubbies can make optimal use of your space. There are many items on the market to help make your closet space more efficient. Find the options that work best for you. However, Mahan's cardinal rule is that you shouldn't buy organizers until you've first cleaned your closet. This seems basic, but it goes a long way. Put clothing back by category, and within each category, organize by color. When you put your shirts, skirts, pants and shoes together, you can see what you actually have in your wardrobe. "People don't see what they have so that's where getting things organized categorically makes a difference," says McCubbin. Mahan says organization can also save you money. "If you can't find clothes, you go buy more, which adds clutter to the clutter." If these tips don't provide the motivation you need, or you just aren't sure where to start, consider hiring a professional organizer to help you with the daunting task. 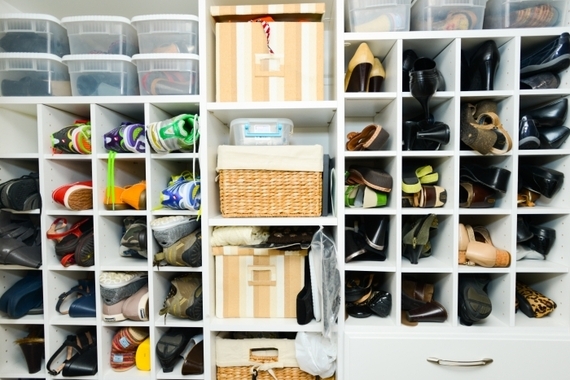 Is your closet in desperate need of de-cluttering? Check out the Angie's List Guide to Closet Organization. This article originally ran on the Angie's List Solution Center. Click here to see the original post.